JUST IMAGINE®…Fun Clothing was incorporated in 1988 by Donna Dobo. We started sewing children's capes at the dining room table. We sold them to schools and daycares by the boxload. In 1988 Just Imagine’s first retail shop opened in Vancouver BC Canada. Now a carefully curated collection of costumes for children and adults is sourced from all over the world to bring the current trends into Just Imagine's year round. Everything is family friendly for all ages. 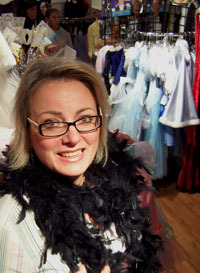 A new boutique just for children opened on the main floor of the Kids Market on Granville Island in 2009. You'll find a map for our current location on our Shops page. As well, Just Imagine is shipping costumes around the world from right here at JustImagineCostumes.com. Just Imagine brings together all the dancewear and dance shoes for ballet, tap, jazz, and gym. It is a tradition to bring young children to Just Imagine for their first dance shoe fitting. At Just Imagine we're dedicated to showing you the finest dress-up play costumes to inspire families and provide endless fun. We're your Halloween headquarters year round, on line, and in our shops, for all your special events. Costume-play is more popular every year because it builds communication skills and relieves stress. It is a unique experience for everyone, and to have fun is the only rule! Thanks for dropping in on us here at justimaginecostumes.com for all your dress-up fun. Enjoy browsing and please keep in mind everything you see is available for immediate delivery, your private information is secure, and your delivery is trackable. Shop online and pick up in the shop if you're local. Call us toll free if you have any questions at 1 866 382 3523.